The Tarkio Gorge is a relaxing beautiful float trip with excellent opportunities for wildlife viewing and birdwatching. It’s home to whitetail and muleteer, elk, black bear, moose, osprey, kingfishers, and eagles. 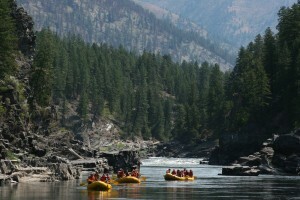 We also offer half day, full day with lunch and gourmet dinner scenic river float trips through this spectacular canyon. Half-day trips include appetizers and beverages. Departs at 9 am daily and returns between 12-1 pm. Departs at 2 pm daily and returns between 5-6 pm. $70 for adults, $50 for children (5-12 years old). Departs at 9 am daily and returns between 2-4 pm. $85 for adults, $65 for children (5-12 year old). Gourmet Dinner includes your choice of either teriyaki chicken, grilled salmon or vegetarian. $115 for adults, $90 for children (5-12 year old). 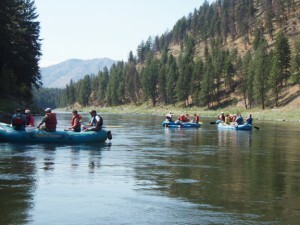 This half day river trip begins above Missoula, travels through Hellgate Canyon and ends in the heart of Missoula. Hellgate Canyon has beautiful scenery and wildlife. You will most likely see lots of birds and you may also see deer, bear, moose, and elk. Raft down the river that Norman Maclean wrote about in A River Runs Through It. “I am haunted by waters,” Maclean says. See for yourself the beauty of this river and its landscapes. You too will be enchanted by your memories of its wildlife, mountain views and fun stretches of gentle water with clear deep pools for swimming. Available April through July. Half-day trips (Late May through mid June only). Departs at 9 am daily and returns between 12 pm – 1 pm. Departs at 2 pm daily and returns between 5 pm – 6 pm. Full-day trips include lunch served riverside. Departs at 9 am daily and returns between 3 pm – 4 pm. $85 for adults, $65 for children (5-12 years old). Departs at 2:30 pm and returns between 7 pm – 8 pm. $115 for adults, $90 for children (5-12 years old). 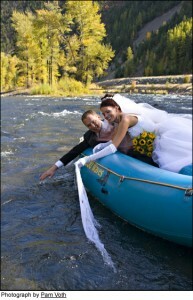 Remember your trip forever with memorable, candid photographs of your adventure down the river! Check out some of our past trips here. Enter your information below to inquire about reservations.